An official from Da Afghanistan Breshna Sherkat (DABS), the country’s power utility company, said on Sunday that a Turkish firm is interested in investing in the Turkmenistan, Afghanistan and Pakistan (TAP) power project. In March last year, the Asian Development Bank (ADB) agreed to finance the project but according to DABS officials, the commitment has not been delivered on so far. According to DABS, the Turkish company is willing to invest in the project, purchase electricity from Turkmenistan and then sell it to Afghanistan “by getting a lower percentage of the benefit”. The ADB has not yet determined the amount need in financial assistance for the project but DABS has estimated that the Afghan section of the project will cost $70 million. TAP 500 KV Power Project is one of the most important regional energy projects. The memorandum of understanding for the project was signed in December 2015 between Turkmenistan, Afghanistan and Pakistan. TAP is a 500-kV transmission line project which falls under the framework of Central Asia Regional Electricity Market (CASAREM). TAP and TAPI are separate projects but will have the same routing. 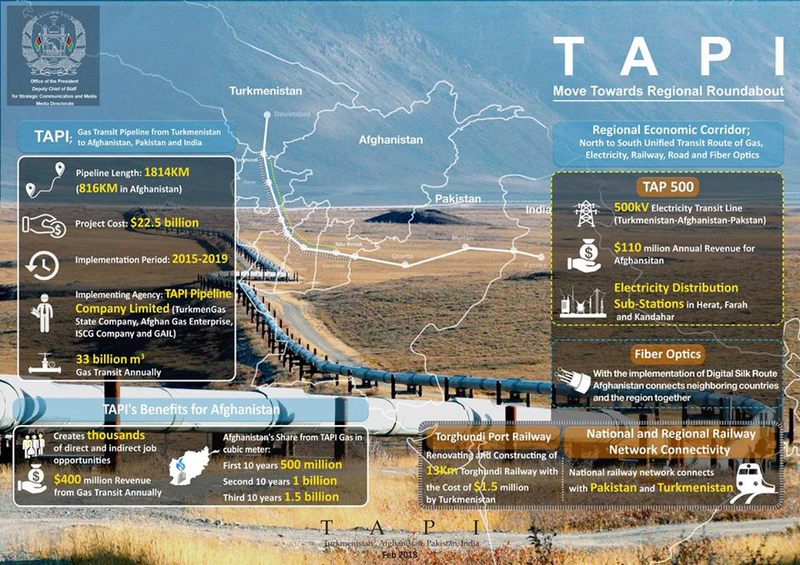 Afghanistan is expected to receive $50 million in transit duties from the TAP project annually, according to DABS. DABS Chairman Amanullah Ghalib said they will hold talks with the interested company on when work on the project can start. “Based on the proposal of the (Turkish) company, the company is interested in investing and we will (have to) purchase the electricity from the (Turkish) company instead of purchasing it from Turkmenistan,” Ghalib said. If that happens, he said, they will not have to take the money from the ADB which pledged to fund the project. However, Ghalib said the amount the Turkish company will invest has not yet been specified. Pakistan will get 1,000 megawatts of imported electricity from Turkmenistan through the TAP project. An official from the Chamber of Mines and Industry said the project will help overcome the electricity shortage for factory owners in the west of the country. “The power line will help address the need for electricity in Afghanistan as we are faced with a lack of electricity and we need almost 400 megawatts of power for industries alone,” said Rahimullah Samandar, CEO of Chamber of Mines and Industry. DABS chairman says they will hold further talks with the company this month.